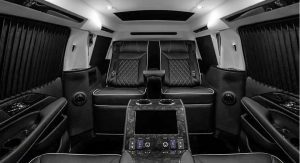 Lexani Motorcars wants a piece of the big luxury SUV pie, and their proposition is a heavily modified Cadillac Escalade called the 30” Extended Viceroy Edition, which they say is the first stretched version of the 2019MY of the SUV. 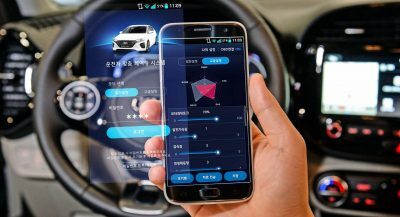 It will instantly catch your eye thanks to its elongated body, which makes the (already big) Escalade look absolutely huge.The factory ESV, upon which it is based, measures 224.3 in (5,697 mm) long. 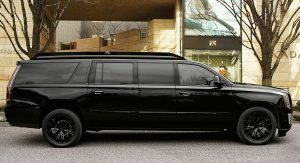 With the 30-inch wheelbase extension, it reaches gargantuan proportions at 274.3 in (6,697 mm), which is nearly 23 feet! However, it’s the amenities inside that make it an office on wheels. Airline-inspired tables, several Apple iPads and even a curved flat-screen TV to keep those sitting at the back busy. 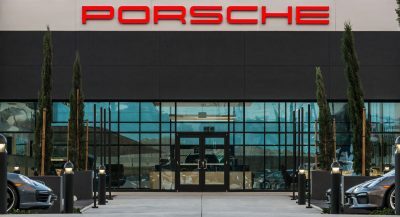 The company has even installed a video conferencing system, upgraded air conditioning and special security system, and most features are controlled via the Control4 touchscreen management system. 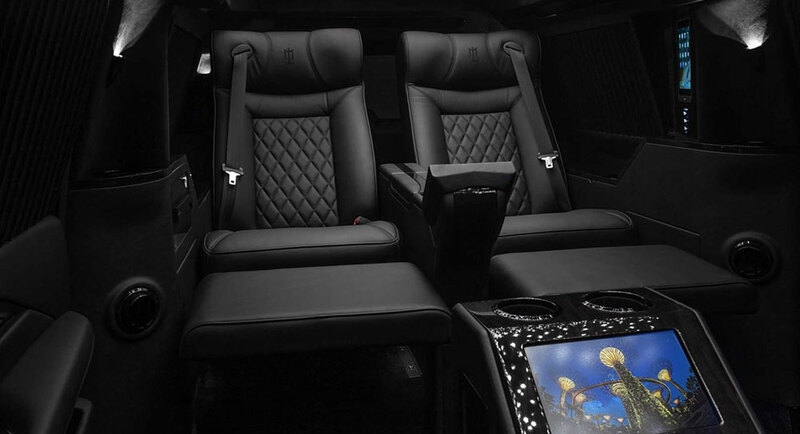 When work is over, passengers can watch a movie or do some gaming on the Playstation 4. And they can do all this while having a drink or two thanks to the upgraded VIP amenity package, which includes champagne flutes and crystal glasses. 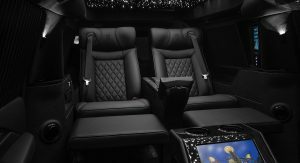 Meanwhile, the diamond-stitched leather power seats and LED ambient lighting in the raised roof certainly contribute to the special stance of this Escalade. Last, but definitely not least, Lexani offers up to B7 level armoring for those who need this level of protection. The Platinum version of a regular Escalade already starts from $94,295. 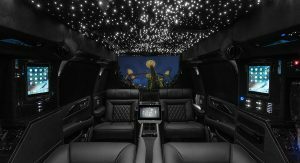 So, while there’s no pricing information available, given all the work that has gone into it and the features that it has, the stretched Escalade should, depending on options, delve well into six-figures. Maybe think about upgrading the brakes on that thing and replacing those getto $150 eBay rims. Those are Lexani wheels. The guy that owns Lexani Wheels also owns this company that customizes these types of vehicles. I’ve seen his work up close and he does some nice work. 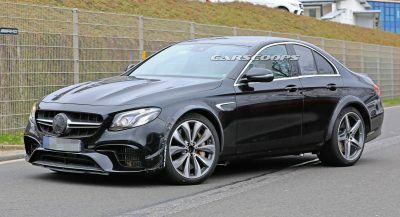 Perhaps the wheels would look better if they were in gunmetal rather than the same gloss black as the rest of the car. That paint combo rarely looks upscale. Especially over time. Lexani wheels or not they look like birds nests and don’t help the look of this vehicle at all. But I do love that interior. Usually, when vehicles are bulletproofed, they’re unsuspecting. You don’t want to tell everyone one “I’ve got LOTS OF MONEY” even if you are bulletproof. The vehicle looks like a long, extended GMC Yukon XL. well, it’s a long extended Cadillac Escalade….so same thing. 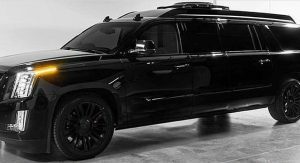 Nothing says “don’t shoot at me” like a murdered-out stretched Escalade. If this is not “The Beast” I don’t know what it is. What part of inconspicuous do these people not understand? Wow it looks like the SUV of doom. Just the thing for high rollers in Vegas to get to the Bellagio from the airport.